In order for a RESTful client to acquire the function signatures of MATLAB® functions deployed to MATLAB Production Server™ using the discovery API, you need to embed information about your MATLAB functions in a JSON file while packaging your deployable archive. After adding the MATLAB functions to deploy to the Production Server Compiler app, in the Include MATLAB function signature file section, select the Create File button. This action creates a template of the JSON file with the name <projectName>functionSignatures.json. The <projectName>functionSignatures.json file is a single JSON object. It contains a schema version and a list of function objects. 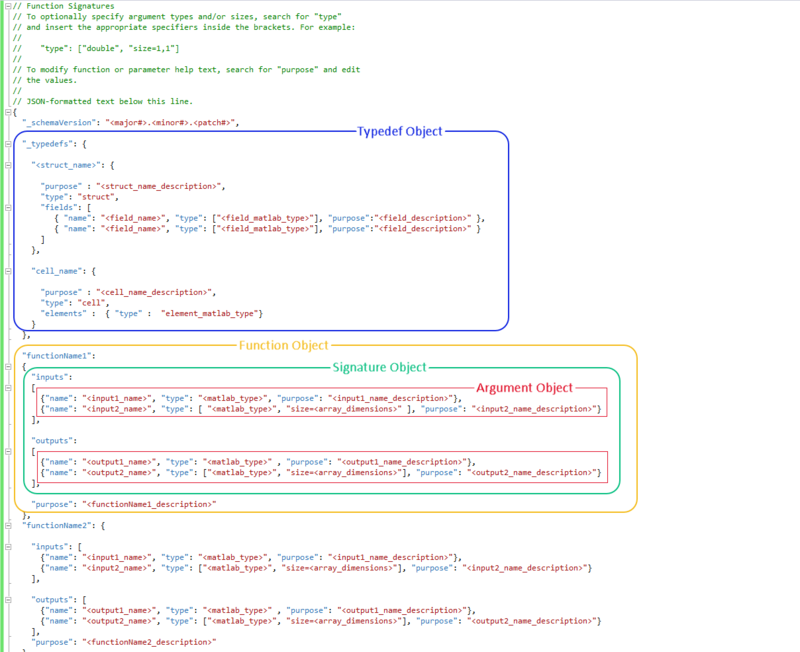 Each function object contains a list of signature objects, and each signature object contains a list of argument objects. If your MATLAB functions pass struct or cell data types, you can add their descriptions to the JSON file as well. You can access the JSON object file from the server by using the Discovery Service. The schema version has a value that is a JSON string in the format <major#>.<minor#>.<patch#>, with each number specified as a nonnegative integer. Function objects automatically inherit their name from the name of the MATLAB functions you have added to the project. The purpose line for the function object is inherited from the function description provided in the MATLAB function. The value of each function object is a signature object. A signature object defines the list of input and output arguments and supported platforms for the function. The value of the properties is an array of argument objects. Each signature can include the following properties. Argument objects define the information for each of the input and output arguments. The order that the inputs appear in the JSON file is significant. For example, in a call to the functionName1 function, in1 must appear before in2. Each argument object can include the following properties. The name of the input or output argument, specified as a JSON string. This property and value are required. The name property does not need to match the argument name in the function, but it is a best practice for it to match any help documentation. The type property defines what MATLAB data type the argument must have. For cell and struct, see Typedef Object. The size property defines the array dimensions of the inputs. It is a comma-separated list of integers. The purpose property provides a description for the arguments. A typedef object defines cell arrays and structures. It needs to be defined only if any of the values to the argument objects are cells or structures. The JSON file template generated does not have this object by default, you are expected to add it if and when needed. In the schema, it is indicated using the name _typedefs and its value is the name of one or more cell or structure objects. The type is the same as the argument object. "purpose": "Unsorted list of students and their scores"
"purpose": "Sorted list of students with respect to their scores"